One additional look at Justice Scalia's record. Then we'll move on. Besides the Supreme Court, there's much to discuss about the New York Court of Appeals--now the "DiFiore Court" with a near total change in personnel. But first, let's conclude this series with a look at a particularly salient and--How should I say?--curious aspect of Scalia's jurisprudence. 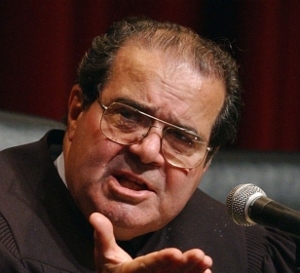 Any consideration of Justice Antonin Scalia's record must include his views on technology. More specifically, the positions he espoused on the use of technological devices by law enforcement in criminal investigations. He was the author of the majority opinion in two of the Supreme Court's most important decisions in recent years on technological surveillance. The cases dealt with the validity of such surveillance undertaken without a warrant. If the surveillance in question constituted a "search" within the meaning of the 4th Amendment, then law enforcement was required to first obtain a warrant. Each of Scalia's opinions was controversial. They raised questions not simply about the ultimate conclusions he reached, but much more so about the constitutional arguments he advanced. Let's take a look. U.S. v. Jones (2012): the Court unanimously held that the government violated the 4th Amendment when it monitored a person's movements for 4 weeks, without a warrant, by means of a GPS (Global Positioning System) device that it surreptitiously attached to his vehicle. Justice Alito authored a separate concurring opinion which 3 other Justices joined. He harshly criticized Scalia for relying on the "18th century tort law" of trespass to decide a constitutional issue about 21st century technological surveillance. He argued that the case should have been decided on the basis of the Court's actual search and seizure jurisprudence which asks "whether [a person's] reasonable expectations of privacy [are] violated by the long-term monitoring of the vehicle he drove." Alito emphasized that the Court had long ago rejected a trespass-based view of search and seizure rights, as well as a rigid limitation to the places enumerated in the 4th Amendment--that the landmark 1967 Katz decision (and the Court's case law ever since) repudiated the old doctrines and focused on the "unjustifiable intrusion by the government on the privacy of the individual" [quoting Justice Brandeis's venerated and vindicated dissent in the 1928 Olmstead case]. Most critically, perhaps, Alito highlighted the fact that much, if not most, technological monitoring can be accomplished today without any technical trespass--i.e., by electronic as opposed to any physical contact. According to Alito and the Justices joining him, the government's warrantless surveillance violated constitutional search and seizure rights, not because there was some minimal "trespass" or "physical intrusion" on a vehicle, but because of the intrusion on legitimate privacy interests. Responding to Alito's concurring opinion, Scalia repeated his position that the 4th Amendment "embod[ied] a particular concern for government trespass upon the areas (“persons, houses, papers, and effects”) it enumerates." Moreover, the Court had "deviated from that exclusively property-based approach [my emphasis]" when it adopted the Katz expectation of privacy test and "said that 'the Fourth Amendment protects people not places.'" Scalia also took issue with the notion that mere monitoring of a person's movements implicates the 4th Amendment. The Court, he insisted "has to date not deviated from the understanding that mere visual observation does not constitute a search [again, my emphasis]." To prove his point, Scalia referred to previous decisions where the Court had held that surveillance of a driver's movements did not constitute a 4th Amendment "search." The reason, according to Scalia, was that in those cases the technological device was actually attached to property that did not belong to the driver--so there was no trespass. Finally, as to his insistence on limiting constitutional protection to trespasses upon the items or places explicitly mentioned in the 4th Amendment, Scalia argued that the text of that Amendment itself "reflects its close connection to property, since otherwise it would have referred simply to 'the right of the people to be secure against unreasonable searches and seizures'; the phrase 'in their persons, houses, papers, and effects' would have been superfluous." By way of example, he noted that the Court has repeatedly refused to apply the 4th Amendment to privately owned land away from one's home (i.e., so-called "open fields")--but only to the "houses," which the text does mention. Florida v. Jardines (2013): in this case, Scalia employed the same analysis to police use of a drug-detection dog. In a 5-4 decision, the Court ruled that the 4th Amendment was violated when the police, without a warrant, brought the dog to a homeowner's porch to investigate the presence of marijuana--which the dog did detect. Writing for the majority, Scalia relied on his Jones opinion. As with the GPS device attached to someone's vehicle in that case, Scalia explained that the police had "physically intru[ded]" with the canine on a place "enumerated in the [4th] Amendment's text." Although the Court had repeatedly held that canine-sniffs themselves were not "searches" withing the meaning of the 4th Amendment [among other reasons because they only detected contraband, not anything constitutionally protected], in this case the government had "gather[ed] information in an area belonging to [the defendant] and immediately surrounding his house—in the curtilage of the house, which we have held enjoys protection as part of the home itself." Scalia contrasted the search in this case with others which the Court had deemed outside the 4th Amendment's protections. One was the investigation of private property beyond the immediate area of a home, and another was the visual observation of the home from airspace. The first was not constitutionally restricted because private lands are not "houses;" the second because there was no physical intrusion, i.e., no trespass. Justice Kagan, writing for herself and two other Justices, concurred in Scalia's opinion. But she explained that the case could--seems like she meant should--have been decided under the Katz rubric of "reasonable expectation of privacy." Aiming "high-powered binoculars" at a home to discover what's inside would be a search because, even without a trespass, it would still be an invasion of protected privacy. Justice Alito, in a dissenting opinion joined by 3 other Justices, argued that the use of the drug-detection dogs did not violate the 4th Amendment. Indeed, the Court had already decided that a canine-sniff was not a "search" under Katz, because it did not invade a legitimate expectation of privacy. But beyond that, Alito contended that Scalia's majority opinion "is based on a putative rule of trespass law that is nowhere to be found in the annals of Anglo-American jurisprudence." According to Alito, Scalia was "unable to find a single case—from the United States or any other common-law nation—that supports the rule on which its decision is based. Thus, trespass law provides no support for the Court’s holding today." Second, Scalia analogized the use of the thermal imaging device to a trespass into the house. He insisted that the device was being used to obtain "information regarding the interior of the home," information that "could not otherwise be obtained without physical 'intrusion' into" the home [my emphases]. Finally, Scalia expressed concern that the "degree of privacy secured" by the 4th Amendment was being eroded by advancing technology. He nevertheless drew the line of constitutional protection at "technology [that] is not [yet] in general public use." And "on the basis of this criterion," the government's use of a thermal imager was a search. Putting it all together, Scalia concluded that, "Where, as here, the Government uses a device that is not in general public use, to explore details of the home that would previously have been unknowable without physical intrusion, the surveillance is a 'search' and is presumptively unreasonable without a warrant [my emphases]." [Disclosure: I agree with the result reached by Justice Scalia in each of these cases. But the analysis used by the Justices to support a decision is typically far more important than the particular result reached in a particular case. It is the analysis that will then be applied by lower courts and by the Supreme Court itself in resolving related issues that they confront thereafter. And with regard to Scalia's analysis, I disagree with it in every case. His trespass analysis dangerously limits the constitutional protection of privacy under the 4th Amendment--the protection that the Supreme Court expressly outlined in its landmark Katz decision a half century ago. [And which Justice Brandeis did 40 years before that.] Indeed, as Justice Alito stressed in his concurring opinion in Jones (the GPS case), most technological surveillance that intrudes on individual privacy does not require any trespass or any other physical intrusion. Just consider: tracking by means of cell phone towers, following by means of drones or helicopters, scrutiny by means of cameras, snooping by means of high-powered binoculars, eavesdropping by means of audio amplifiers, etc., etc., etc. If trespass analysis was ever an adequate basis for constitutional adjudication, it certainly is not in the modern world. Similarly, Scalia's insistence on the textual limits of the 4th Amendment's enumerated items undermines what has long been recognized as the fundamental principle underlying search and seizure rights--protecting "people not places." That is, securing the personal privacy essential in a free society, not merely protecting the physical interests in the items specifically mentioned. Note well, private property--other than "house"--is not mentioned. Likewise, private conversation is not mentioned. Neither is a person's movements or whereabouts. Indeed most of what people in a free society would consider to be private, whether places or conduct, is not mentioned. Then there's Scalia's limited protection to technology that is "not in general public use." Of course, the technology that is in common use has been expanding exponentially and will continue to do so. May any of it be used by the government with impunity? Yes, according to Scalia's formula. From binoculars and other visual enhancing devices, to audio amplifying devices (regularly advertised, readily available, and widely used), to drones, etc., etc., etc.--as technologies advance and become more readily available, personal privacy protection under the Constitution diminishes drastically under Scalia's formula. So this concludes the series on Justice Scalia's record. As I said at the outset, I certainly hope he is resting in peace and that he has reached the heavenly afterlife in which he apparently believed. Beyond that, if there is such an afterlife, I presume that Justices Louis Brandeis (Olmstead dissent) and John Marshall Harlan II (Katz concurring opinion) are explaining to him, much better than I could, the errors of his privacy jurisprudence.